Lamar Walden helped to create the rebirth of the Chevrolet 348-409-427 Z-11, V-8 engine. 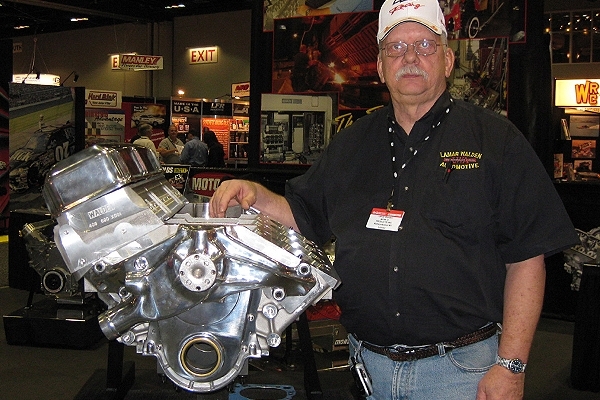 Shown here with his highly modified, improved and strengthened “409”, Lamar’s engine included new aluminum heads from Edelbrock, and the new aluminum BMP block. These Lamar Walden-influenced components produced 409-based engines easily capable of 1,000+ hp. Lamar Walden’s knowledge and experience with building high-horsepower Chevy “W-Series” 348-409-427 Z-11 engines was legendary. “Mr. 409” was known for his dedication to the modification and improvement of the ’09 engine. Lamar’s “World’s Fastest 409”, ’62 Bel-Air “Bubble-Top” has turned low seven-second, 200 mph times with Lamar’s engine power and tuning. Editor’s Note: Due to website technical difficulties (Re: This Editor’s steep learning curve for posting stories and photos on this website) the story below did not appear on the HOF site soon after the passing of Lamar Walden. Out of my sincere respect for Lamar Walden and condolences to his family, I am now posting this story. Rest in Peace, Mr. 409. Robert Lamar Walden, of Lilburn, GA, whose drag racing career spanned seven decades, passed away Friday, August 28, 2015, following a lengthy battle with cancer. Lamar Walden was 74. Lamar was inducted into the East Coast Drag Times Hall of Fame, class of 2012, one of many honors he received for his racing success during a long career. Lamar’s drag racing career began with a 1957 Chevy running in Stock Eliminator. Over the next five decades he built, tuned and drove various Stockers, Gassers, Super Stocks, Pro/Stocks and later, nostalgia match racers. A master engine builder and tuner, Walden and was best known for his mastery and later revival of the Chevrolet “W-Series” 348-409-427 (Z-11) V-8 engine. The “W-Series” engines gained legendary fame during their brief yet hugely successful racing days from 1958 through 1964. W-Series engines powered drag racers and circle track racers to many victories during those years. With its uniquely scalloped, easily-identified rocker covers, the 409 became a 60’s cultural icon as the title of the classic rock song: “She’s Real Fine, My 409”. In mid-1965 Chevrolet launched the Mark-IV “big-block” Chevy. The 409 was discontinued, ending its colorful five-year reign as king of the muscle car powerplants. Interest in the engine dwindled until several years later, when classic car enthusiasts “discovered” the 409 and the full-size Chevys they powered. The famous Bill Jenkins-Dave Strickler ’63 Z-11 Impala was one of the first such race car restorations. The “Old Reliable” began making 11-second, 120 mph runs at nostalgia events, arousing interest. Lamar Walden’s reputation as a 409 authority brought him a steady stream of customers who wanted parts and machine work for 409’s. 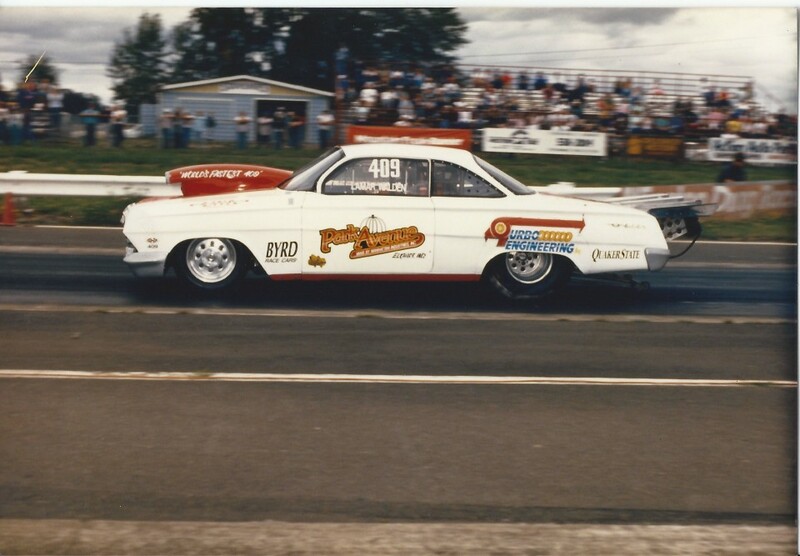 Next came nostalgia match racing among drag racing’s early premier stars, “Dyno Don” Nicholson, Arnie “The Farmer” Beswick and others, including Lamar’s own ’62 Bel-Air “Bubble Top”. The new nostalgia racers looked like their 60’s counterparts, but the new breed of cars were running seven-second, near 200 mph numbers! Lamar’s focus turned to designing and machining parts that boosted power and enhanced reliability for these W engines. Surprisingly, these engines, although based on a 50 year old design, soon became as sophisticated as those used in contemporary Pro Stock racing. Lamar’s own race car was a much-modified, ’62 Bel-Air that had been cleverly scaled-down to about 7/8 size, to improve aerodynamics. With Lamar’s “big-time, 09” power it soon became known as “World’s Fastest 409”. As the premier engine builder for sophisticated “W-Series” based 409 engines, Lamar’s shop became extremely busy with new customers and old, forging his legend. Lamar’s racing business began in 1968, in Doraville, GA. “Lamar Walden Automotive” customers included many of drag racing’s best known figures as well as racers looking for micro-accurate machine work. Walden’s precisely machined pieces, powerful race engines, treasured advice and stories stemmed from a lifetime in racing. Lamar had “connections” at Chevrolet, and in 1969 he bought one of the fabled ‘69 Chevrolet Camaros with the aluminum block and heads, the C.O.P.O. (Central Office Production Order) ZL-1 option cars. Chevy built just 69 of these in total, making them among the rarest and most treasured (ZL-1 survivors are currently valued in the six-figure range!) of all 60’s era musclecars. The ZL-1 427 big-block was factory rated at 430 hp, easily producing in excess of 500! He successfully ran his ZL-1 in NHRA SS/C class but later, to field a car more competitive in Super Stock Eliminator racing, built an L-72, iron 427 and dropped down a class, to NHRA’s SS/D. In the early 1970’s Lamar’s reputation as an engine builder, tuner and driver led him to become involved in Pro Stock racing. For a time Lamar drove and campaigned Barry Setzer’s small-block Chevy Vega. Barry Setzer was a North Carolina textile baron who loved big-time drag racing and had the financial resources to pursue his passion. Setzer fielded the Pro Stock team that Lamar drove for as well as a top grade nitro Funny Car team in the 70’s. Lamar’s on-the-road racing days were numbered however. After scoring more than 30 Pro Stock Eliminator titles, Lamar gave up pro drag racing to spend more time at home to focus on his family and his expanding business. Lamar could not abandon his lifelong passion for racing, and soon he and son Rob built his notorious original ’62 Chevy nostalgia match racer. This breakthrough race car set new standards for the emerging nostalgia match racers. Like its 1962 original base, it was powered by a Lamar Walden specialty, an outrageously modified and hugely improved 409 based V-8. Lamar’s fondness for the Chevy “W-Series” 348-409 engine family led him to scratch-build and develop many components for these fabled engines. He also provided input on the development and release of Edelbrock’s aluminum heads for the 409 engines. The new Edelbrock heads, produced for an engine discontinued in 1965, proved highly popular and fueled an even greater resurgence in interest in the 409. Since then aluminum blocks with cast-iron cylinder liners have also become available for the W-Series engines, and their popularity continues to grow! This resurgence is due in a great part to Lamar Walden, who created parts where there were none, and showed that the 409 was still a viable race engine. The shining legacy created by Lamar Walden’s many years in racing has not ceased due to his passing. Lamar’s son Robert, Jr., has worked side-by-side with his dad from the earliest days. Robert grew up in the shop and at the track. He began by literally sweeping the floors in the shop and learning everything possible from Lamar’s endless fountain of knowledge and experience. That legacy and the legend created by Lamar Walden is being continued by Rob Walden and Lamar Walden Automotive. The East Coast Drag Times Hall of Fame offers its condolences to the friends and family of 2012 Hall of Fame inductee, Robert Lamar Walden. Previous Previous post: Della Woods: This Funny Honey Never Lost Her Groove!